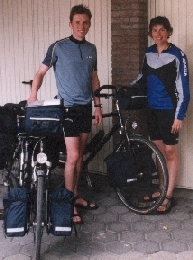 In april/may of 2003, Eric and I cycled from our home in the Netherlands to Barcelona, Spain. You'll find our "live" travelogue, written at internet cafes along the way, on these pages. You can find a map of our route on this page. We followed the route described by Paul Benjaminse. See Judith's page on Barcelona, from an earlier trip.